Police Constable, Collis ‘Chucky’ Brown, has been sentenced to life in prison. The reputed member of the so-called Clarendon-based police death squad will serve 51-years before being eligible for parole. Constable Brown, who was accused of being one of the main perpetrators of the extra-judicial killings carried out by the death squad, was found guilty on three counts of murder on November 15 last year. Presiding Judge, Viviene Harris, says Constable Brown’s conviction has brought members of the constabulary and the administration of justice into considerable disrepute. The 42-year-old Police Constable has been a member of the Constabulary for 21 years. The social inquiry report described Brown as a married father of five. The court was told Brown attends church regularly and had no prior convictions. Family members described him as helpful, cool and a mediator. While pleading for leniency, members of the community where Brown lived described him as a man who maintained discipline in his neighbourhood. Brown’s attorney, Norman Godfrey also pleaded for leniency from the court. In pleading for a short sentence, Mr. Godfrey asked the court not to treat Brown as what he called “a sacrificial lamb” after Brown claimed in a letter during his trial that he was acting on instruction from his superiors in the Constabulary. Brown appeared relaxed in the dock and at one moment even managed a smile. 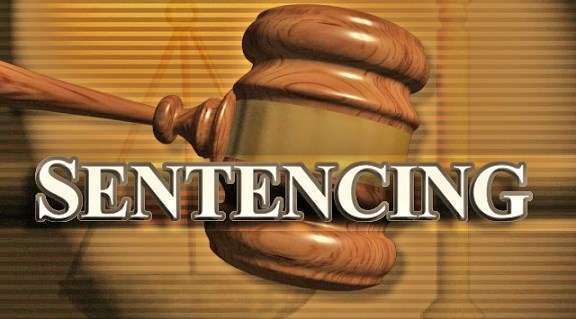 Before handing down her sentence, Presiding Judge, Viviene Harris, said the high crime rate in the country is no reason for anyone to take the law into their own hands. Justice Harris says it was Brown’s responsibility as a member of the JCF to investigate crimes and place those who commit those crimes before the court for due process. She says this case has brought members of the constabulary and the administration of justice into considerable disrepute. The long-serving policeman will now spend the next 51-years of his life in prison. He won’t be eligible for parole until he’s 93 years old. For the 2012 murders of Andrew ‘Sugar’ Fearon and Dwayne ‘Murderous’ Douglas, Constable Brown will serve 31 years for each count. These will run concurrently. He was initially sentenced to 40 years on each count but 9 years were taken off each count for time served and good antecedents. For the 2009 murder of Damoy ‘Gutty’ Dawkins, Brown was sentenced to 29-years. He’ll, however, serve only 20-years after having 9 years removed for time served and good antecedents. On the count of conspiracy to murder he gets 8-years at hard labour. On the count of wounding with intent, he gets 15-years. These three counts run concurrently for a total of 20 years. Before the sentence was handed down, Constable Brown declined the offer to say something for himself. He was silent, showing no emotion while being led away from the courtroom.